Community Psychology Practice: SCRA has a new website! SCRA has a new website! 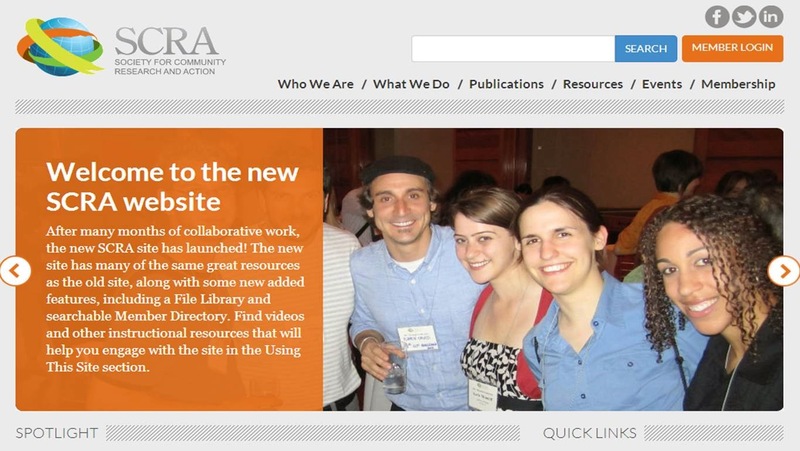 After many months of collaborative work, the new SCRA site has launched! The new site has many of the same great resources as the old site, along with some new added features, including a File Library and searchable Member Directory. Find videos and other instructional resources that will help you engage with the site in the Using this Site section. The SCRA website is organized around the major areas of Practice (resources and support for people working on community change), Education (information on training programs, career development, and educational materials in community psychology), Research (an exploration of the research topics and methodologies in community psychology), and Policy (work on the effects of public policy on community well-being). In other areas of the website major publications related to community psychology are described, including two publications from SCRA, The American Journal of Community Psychology and The Community Psychologist. You can also learn about SCRA, including our committees and interest groups, our leadership, the SCRA Biennial conference and other events, SCRA Awards and Fellows, a directory of our members, and the benefits of joining our organization. This site contains a great deal of information. For a guide to the most popular areas of the site click here. Instructions for finding information on the site are included below.